Hey guys. Lincoln, a car company, has a smell now. According to a press release, Lincoln is "hoping to create an emotional connection between the luxury brand and consumers," and since they can't do that with their lame cars they're doing with it with a smell. I don't understand what that last part means. 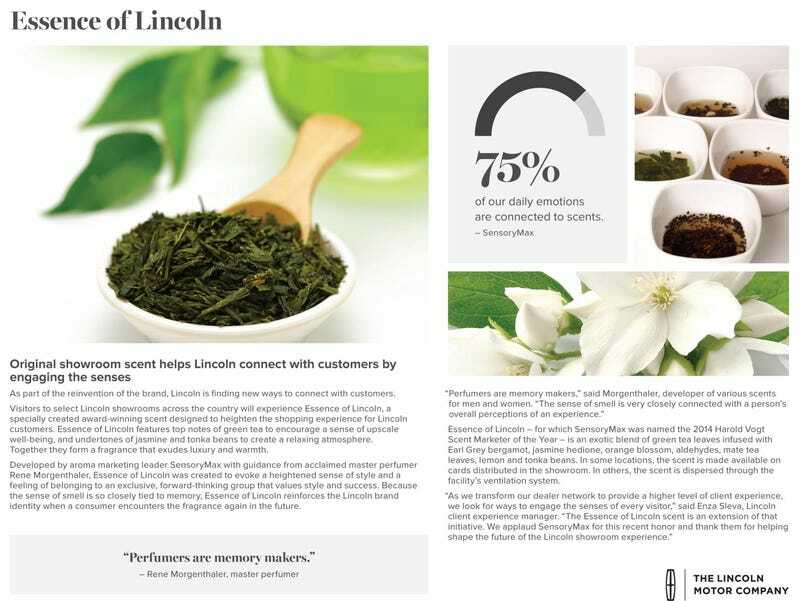 In Essence of Lincoln, Morgenthaler infused top notes of green tea (to encourage a sense of upscale well-being) with undertones of jasmine and tonka (to create a relaxing atmosphere). Together they form a fragrance that exudes luxury and warmth. Green tea and jasmine. That's how we're selling Lincolns these days. Okay. The smell will waft through dealerships thanks to scented cards or it will be dispersed through the ventilation system. Other things that can be dispersed through ventilation systems include sarin gas. Lincoln is not doing that. Lincoln is the luxury division of the Ford Motor Company.